Love the mahogany,nice job. Is your Sig held with magnets? that’s one deadly night stand,i guess no one comes into your bedroom announced-lol.nice job. This is a very creative table for a special purpose. OnhillWW, yes I have 2 ceramic magnets covered with adhesive felt to hold the gun in place. Nice table! Good place for the pistol to make it real handy. 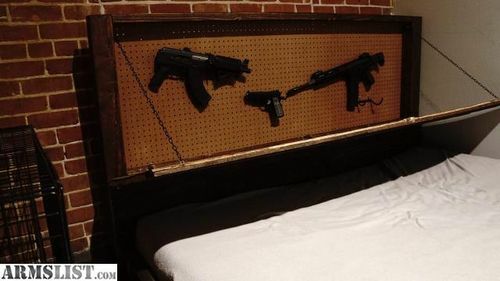 I will see your PISTOL nightstand and raise you 2 machine guns!! well played richardchaos, well played. however i can get mine with out getting out of the covers….